I used to top most casseroles with shredded cheese. Now that we don’t use cheese anymore, I’ve taken to using buttered cornflake crumbs instead. It’s a satisfying substitute. You’ll find the recipe for them directly after the recipe proper. This recipe has been one of my more successful adaptations to gluten free, dairy free cooking. The original recipe called for a can of tomato soup, which contains both gluten and dairy. I tried a lot of variations with ketchup, preparing a tomato sauce before hand, and pretty much anything you can think of to replace canned tomato soup. Finally I hit upon something simple. I use an 8-ounce can of tomato sauce and the same can filled with dairy-free milk, and then add a spoonful of sugar. The results were spectacular and just as easy to make as the original recipe. First prepare the macaroni according to package directions. 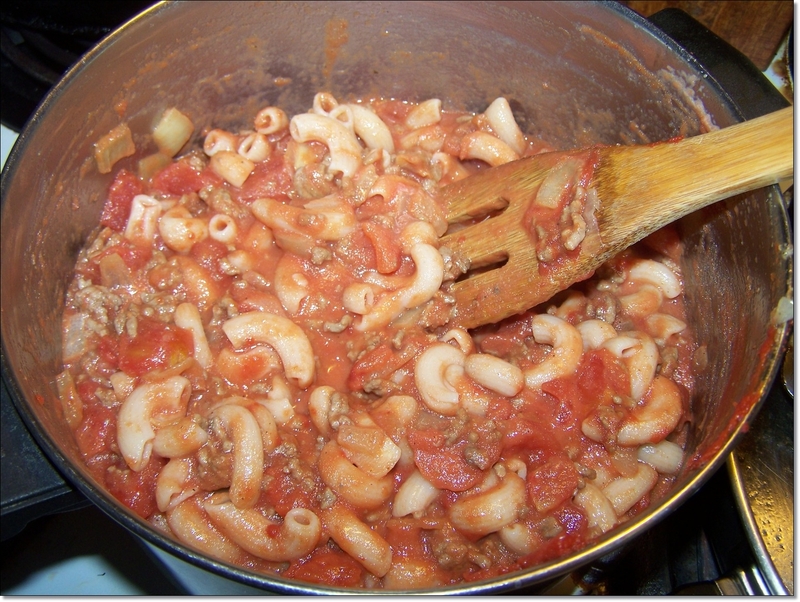 Use a large pot to boil the macaroni because you will use the same pot to mix the casserole in. While the macaroni is cooking peel and chop your onion. Set it aside. Plop the ground beef into a skillet and fry it over medium-high heat. Break it up into small pieces as it cooks. When it’s evenly browned drain off the fat. If desired, pour the beef into a strainer and rinse it under hot tap water. Rinse the skillet too. Return the beef to the skillet and add the onion. Add a splash of water if the skillet seems too dry to cook the onion. Fry the beef and onion for about 5 minutes, or until the onion is somewhat tender. Set it aside until the macaroni is done. While you’re waiting for the macaroni to cook measure 2-cups of cornflakes or Rice Chex or Corn Chex into a medium sized mixing bowl. Mash the cereal with your hands or a pestle or the bottom of a sturdy cup. This is a good job for a kid. When the crumbs are crumbly stir in the melted margarine. You can melt it in the microwave or on the stovetop. Stir the margarine into the crumbs until they are evenly coated. Set them aside. The macaroni is probably done now. Drain it (in the same strainer you used to drain the beef) well. Pour the macaroni back into the pot. Add the ground beef and onion. Open up the cans of tomato products and add all of them too. Pour dairy-free milk into the empty 8-ounce tomato sauce can. Pour the milk into the pot with the beef and tomato and macaroni. Add the salt, pepper and sugar. Stir it all up until it’s well mixed. Turn the mixture into a 2-quart casserole that you have sprayed with no-stick spray or rubbed with solid vegetable shortening. Sprinkle the buttered cereal crumbs on top. Bake at 400° for 25 minutes or until hot and bubbly. To make a meal serve it with steamed broccoli or zucchini and potato salad. This casserole is always wildly popular at potlucks. I even had people come up to me afterwards and thank me for bringing something without cheese on top, usually older folks with digestive issues. 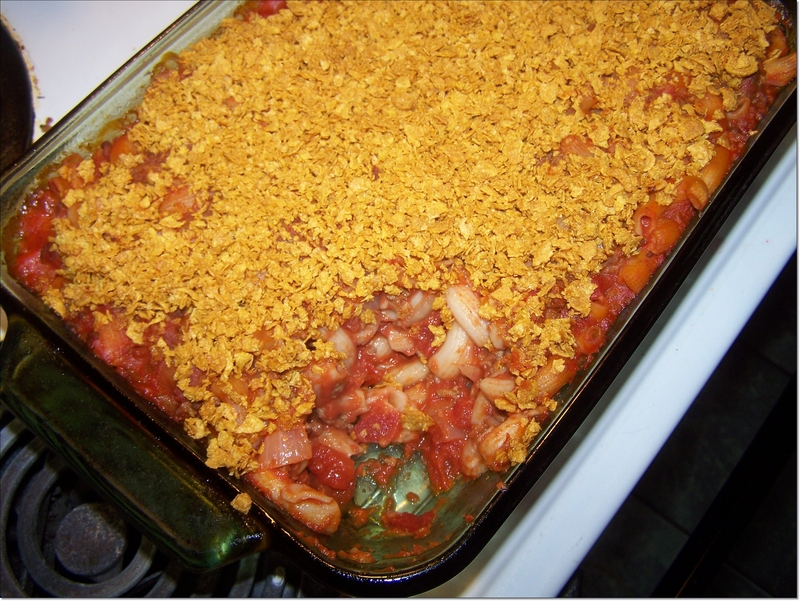 This casserole is lovely for make ahead meals. Simply prepare it as directed, but do not bake it. Cover it with plastic wrap (cheaper) or tin foil and allow it to cool. Store in the refrigerator for up to a day. When you’re ready to bake it, remove the foil or plastic wrap and slide it into the oven. Set the oven to 375° and let it bake for 35 to 40 minutes, or until hot and bubbly. Comment is unrelated, but I just wanted to thank you so much for all the work and diligence you’ve put into An Old Fashioned Education. My oldest is in a Christian preschool right now, but I’m using your resources as a framework to build a curriculum for my children from here on out. A million thanks again!